First-winter (Sep-Mar) similar to juvenile, but head and upper breast whiter with narrower dark streaks (especially around eye and on hindneck); forehead normally white. May show dark ear-spot. Mantle and scapulars pale grey to buff with blackish subterminal bars or anchor-shaped spots; often intermixed with juvenile feathers. Bill similar to juvenile, but some develop paler base from early winter. Pale individuals have whitish underparts, narrower dark subterminal marks on upperparts and narrow dark covert-markings. 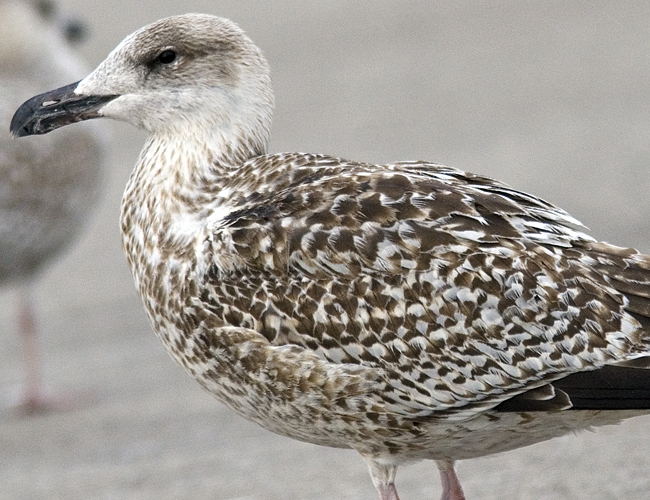 With wear may bleach as described under Herring Gull, but rarely as extreme (an extremely pale spring bird shown by Grant (1989a) could to my eyes be partly leucistic, as the upperparts appear unmarked, which is atypical even in very worn birds). 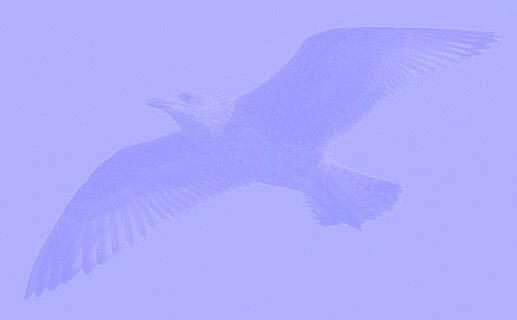 (Malling Olsen, K. & Larsson, H. 2004 Gulls of Europe, Asia and North America. London: Christopher Helm). Juvenile moult to first winter plumage partial Aug-Nov, including mantle, scapulars, and (probably) parts of head and body. Often no sign of moult into Nov/Dec. 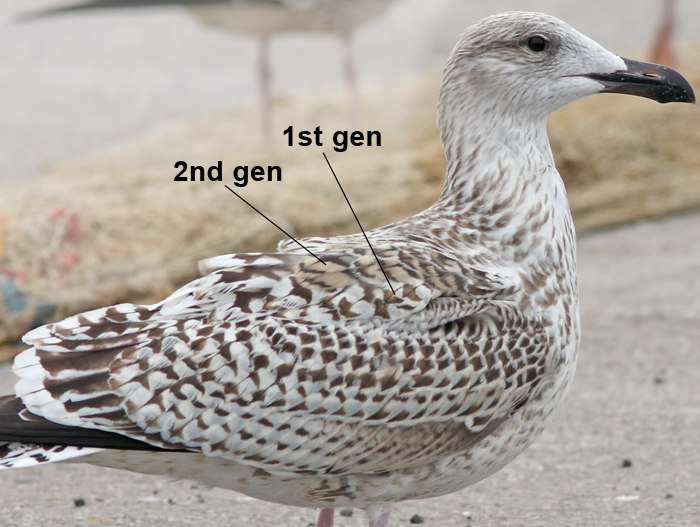 (Malling Olsen, K. & Larsson, H. 2004 Gulls of Europe, Asia and North America. London: Christopher Helm). Although Malling Olssen states "often no sign of moult into Nov/Dec", this is not supported by data of ringed birds. The table presented in September illustrates that already 40% (n = 10) do show the first signs of moult, i.e. new upper scapulars. By November, over 90% (n = 45) replace the upper scapulars and 75% has started moult in the lower scapulars as well. 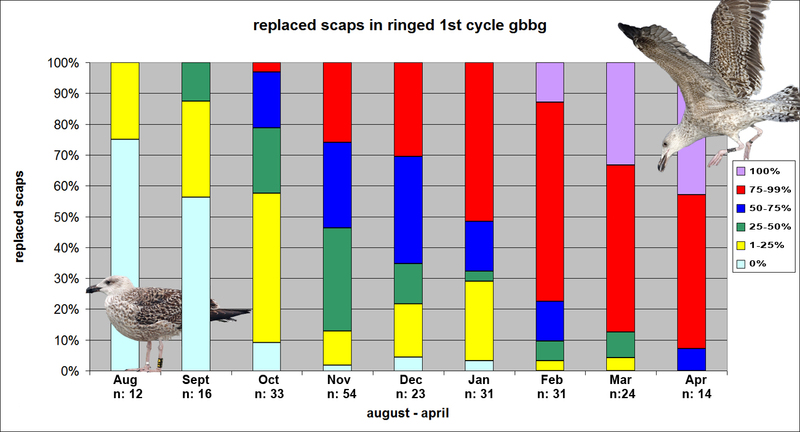 By November, all ringed birds (except for 3EN blue from Ireland) had at least some new upper scapulars, with the majority of birds categorised ">75% of the upper scpaulars replaced". There may be a bias towards southern populations, as many images on this site are from birds ringed in S Norway or colonies further south like Denmark and France. It remains pure speculation, but it would be interesting to know where very fresh juvenile birds in November, like THIS ONE hatched. Birds similar to this one, but still fresh by 2cy March, are represented by THIS POWERFULL bird, which is believed to have travelled from far northern Europe. A far northern hatching colony does not necessarily reflect late moult in scapulars. In February we photographed this Russian bird from Murmansk, with quite average moult scores in the scapulars. All wing-coverts, tertials and flight feathers still juvenile by October. By November, one single bird (J17Y) that had gc2 missing. top: marinus 1cy JJ77 November 25 2006, Boulogne/Mer, N France. Picture: Mars Muusse. Within the sample of ringed birds on this site, this is the most 'retarded' bird' for November, with only single upper scapulars replaced. Class: US=1-25%, LS=0%, TOT SCAPS=1-25% . below: marinus 1cy JP568 November 15 2012, Boulogne-sur-Mer, NW France. Picture: Jean-Michel Sauvage. Example bird for several individuals that have almost all scapulars replaced for 2nd gen feathers. As a rule, the rear feathers in the lowest row of scapulars are the last juvenile feathers in the scapular region. Class: US=100%, LS=75-99%, TOT SCAPS=75-99% . Moult in 1cy November GBBG - ringed birds. below: graph corresponding to data from table 1. n=54. 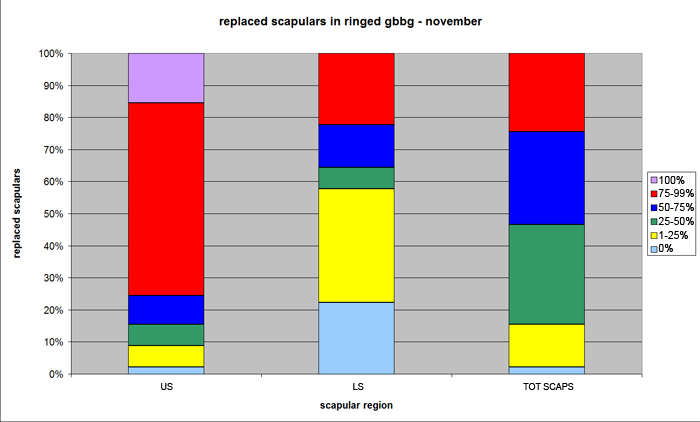 Distribution of replaced 2nd generation scapulars in November 1cy GBBG, separated into Upper Scapulars, Lower scapulars and for Total scapular region. Classification in 6 classes, running from 0% (no 2nd gen scaps) to 100% (all scaps in a region have been replaced). It is clear from the column "Total scapulars" that less than 10% of the ringed November birds scored "0% 2nd gen scaps" (in fact, only 1 out of 45 ringed birds was still in completely juvenile plumage), in other words, the other 90+% of those 45 ringed birds had replaced at least one or more (upper) scapulars for 2nd gen feathers. below: Great Black-backed Gull JA804 illustrates differences in colour and pattern between old juvenile 1st generation scapulars and fresh buffish 2nd generation feathers. Bird ringed as pullus on June 12 2012 at Salvøy, Karmøy, Rogaland, Norway (59°17'54"N 005°12'27"E). Picture: Jean-Michel Sauvage, September 28 2012, Boulogne-sur-Mer, NW France. below: Distribution of replaced scapulars for "Total scapular region" for months August in hatch year until commencement of first complete moult in April. Classification in 6 classes, running from 0% (no 2nd gen scaps) to 100% (all scaps, including long rear scaps, have been replaced). Only ringed birds, n=238. Origin of all 191 ringed bird, used in our sample. Several individual birds observed in more than one month. Great Black-backed Gull (Larus marinus) 1cy JP36 November 17 2002, Westkapelle, the Netherlands (51.33 N, 3.25 E). Great Black-backed Gull (Larus marinus) 1cy J5UK November 25 2006, Boulogne/Mer, N France. Great Black-backed Gull J7MZ (Larus marinus) 1cy: November 24 2007, Boulogne-sur-Mer, France (50.42 N - 01.34 E). Picture: J-M Sauvage. Great Black-backed Gull (Larus marinus) 1cy JC2Z November 25 2006, Boulogne/Mer, N France. Great Black-backed Gull JJ0Y (Larus marinus) 1cy: November 10 2006, Boulogne/Mer, France. Picture: J-M Sauvage. Great Black-backed Gull JA8N (Larus marinus) 1cy: November 10 2006, Boulogne/Mer, France. Picture: J-M Sauvage. Great Black-backed Gull (Larus marinus) 1cy J1UH November 16 2006, Boulogne sur Mer, France (50.44 N - 01.35 E). Picture Jean-Michel Sauvage. Great Black-backed Gull (Larus marinus) 1cy JH092 November 06-10 2010, Westkapelle, The Netherlands. Picture Corstiaan Beeke & Ies Meulmeester. Great Black-backed Gull (Larus marinus) 1cy JH380 November 04 2010, Westkapelle, the Netherlands. Great Black-backed Gull (Larus marinus) 1cy JH837 November 18 2010, Boulogne sur Mer, France (50.44 N - 01.35 E). Picture Jean-Michel Sauvage. Great Black-backed Gull (L. marinus) 1cy JP086 November - December 2011, Boulogne sur Mer, France (50.44 N - 01.35 E). Picture Jean-Michel Sauvage. Great Black-backed Gull (marinus) 1cy JP625 November 27 2012, Boulogne-sur-Mer, NW France. Picture: Jean-Michel Sauvage. Great Black-backed Gull (marinus) 1cy JP760 November 27 2012, Boulogne-sur-Mer, NW France. Picture: Jean-Michel Sauvage. Great Black-backed Gull (marinus) 1cy JP568 November 15 2012, Boulogne-sur-Mer, NW France. Picture: Jean-Michel Sauvage. Great Black-backed Gull (Larus marinus) JP778 1cy: October - November 2012, Den Oever, the Netherlands. Great Black-backed Gull (Larus marinus) JP807 1CY, November 03 2016, Boulogne sur Mer, France (50.44 N - 01.35 E). Picture Jean-Michel Sauvage. Great Black-backed Gull (Larus marinus) JT370 1cy, November 19 2013 & January 02 2014 (R.I.P. ), Boulogne sur Mer, France. Picture Jean-Michel Sauvage. 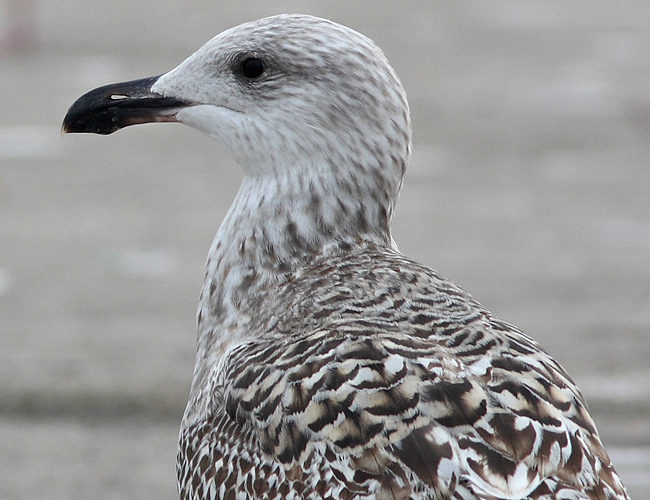 Great Black-backed Gull (Larus marinus) JT061 1-2CY, November 2013 & October 2014, Boulogne sur Mer, France. Picture Jean-Michel Sauvage. Great Black-backed Gull (Larus marinus) JT275 1cy: October & November 2014, Zandvoort-IJmuiden, the Netherlands. Picture: Martijn Los. Great Black-backed Gull (Larus marinus) JT311 1cy-2cy: November 2013 & January 2014, IJmuiden, the Netherlands. Great Black-backed Gull (marinus) 1cy JT933 November 22 2013, Boulogne sur Mer, France. Picture Jean-Michel Sauvage. Great Black-backed Gull (Larus marinus) JU116 2CY, November 03 2014 & February 23 2015, IJmuiden, the Netherlands. Great Black-backed Gull (Larus marinus) JU883 November 09 2014, IJmuiden, the Netherlands. Picture: Robert van der Meer. Great Black-backed Gull (marinus) 1cy JY084 November 04 2012, Boulogne-sur-Mer, NW France. Picture: Jean-Michel Sauvage. Great Black-backed Gull (Larus marinus) JZ410 1cy: November 22 2014, Hondsbossche Zeewering, the Netherlands. Picture: Caroline Walta. Great Black-backed Gull (Larus marinus) JZ855 1CY, November - December2015, IJmuiden, the Netherlands. Great Black-backed Gull (Larus marinus) JYA88 1cy: November 07 2013, IJmuiden, the Netherlands. Picture: Lars Buckx. Great Black-backed Gull (Larus marinus) JWC60 1CY, November 27 2015, IJmuiden, The Netherlands. Picture: Jan Zorgdrager. Great Black-backed Gull (Larus marinus) JWU97 1CY, November - December 2016, Katwijk & IJmuiden, the Netherlands. Great Black-backed Gull (Larus marinus) JYY47 1CY-2CY, November 01 2014 & February 27 2015, Scheveningen, the Netherlands. Great Black-backed Gull (Larus marinus) JYY84 1cy: November 23 2014, Ter Heijde, the Netherlands. Picture: Caroline Walta. Great Black-backed Gull (Larus marinus) 1cy J09Y November 23 2007, Westkapelle, the Netherlands. Great Black-backed Gull (Larus marinus) 1cy J17Y November 24 2007, Boulogne-sur-Mer, France (50.42 N - 01.34 E). Picture: J-M Sauvage. Great Black-backed Gull (Larus marinus) 1cy J22Y November 08 2007, Boulogne-sur-Mer, France (50.42 N - 01.34 E). Picture: J-M Sauvage. Great Black-backed Gull (Larus marinus) 1cy J33Y November 02 2007, Boulogne-sur-Mer, France (50.42 N - 01.34 E). Picture: J-M Sauvage. Great Black-backed Gull (Larus marinus) 1cy JJ26 November 25 2006, Boulogne/Mer, N France. Great Black-backed Gull (Larus marinus) 1cy JJ66 November 25 2006, Boulogne/Mer, N France. Great Black-backed Gull (Larus marinus) 1cy JJ77 November 25 2006, Boulogne/Mer, N France. Great Black-backed Gull (Larus marinus) 1cy JK38 November 25 2006, Boulogne/Mer, N France. Great Black-backed Gull (Larus marinus) 1cy JL25 November 25 2006, Boulogne/Mer, N France. Great Black-backed Gull (Larus marinus) R745 November 07 2014, Boulogne-sur-Mer, France. Picture Jean-Michel Sauvage. Great Black-backed Gull (marinus) 1cy HM07 November 15 2012, Boulogne-sur-Mer, NW France. Picture: Jean-Michel Sauvage. Great Black-backed Gull (marinus) 1cy HM09 November 17 2012, Boulogne-sur-Mer, NW France. Picture: Jean-Michel Sauvage. Great Black-backed Gull (Larus marinus) H006 1CY, November 03-05 2016, Boulogne sur Mer, France (50.44 N - 01.35 E). Picture Jean-Michel Sauvage. Great Black-backed Gull (Larus marinus) H012 1CY, November 16 2016, Katwijk, the Netherlands. Great Black-backed Gull (marinus) 1cy 3M-0148 November 21 2012, Boulogne-sur-Mer, NW France. Picture: Jean-Michel Sauvage. Which country??? Great Black-backed Gull (marinus) 1cy xxx0131 November 01 2012, Boulogne-sur-Mer, NW France. Picture: Jean-Michel Sauvage. Great Black-backed Gull (Larus marinus) 1y CZD November 01 2008, Boulogne / Mer, France. Great Black-backed Gull (Larus marinus) 1cy 46D November 05 2008, Boulogne / Mer, France. Great Black-backed Gull (marinus) 1cy L28 November 21 2012, Boulogne-sur-Mer, NW France. Picture: Jean-Michel Sauvage. Great Black-backed Gull (Larus marinus) M57 1cy: November 05 2013, Westkapelle, the Netherlands. Picture: Corstiaan Beeke. Great Black-backed Gull (Larus marinus) 75L 1cy-2cy, November 2012 & November 2013, Boulogne sur Mer, France. Picture Jean-Michel Sauvage. Great Black-backed Gull (marinus) 1cy 94L November 15 2012, Boulogne-sur-Mer, NW France. Picture: Jean-Michel Sauvage. Great Black-backed Gull (Larus marinus) 97M 1cy, November 27 2013, Boulogne sur Mer, France. Picture Jean-Michel Sauvage. Great Black-backed Gull (Larus marinus) 57U November 18 2015, Boulogne sur Mer, France. Picture Jean-Michel Sauvage. Great Black-backed Gull (Larus marinus) 1JK 1CY & 4CY, November 2011 & June 2014 , near Dublin, Ireland. Picture: Stephen Lawlor & Graham Prole. Great Black-backed Gull (Larus marinus) 1VA 1st cycle (1CY-2CY), September 2013 - January 2014, Dublin, Ireland. Picture: Graham Prole. Great Black-backed Gull (Larus marinus) 1VU 1CY-2CY, November 2013 & June 2014, near Dublin, Ireland. Picture: Graham Prole. Great Black-backed Gull (Larus marinus) 3AL 1CY, October - November 2013, Dalkey, Dublin, Ireland. Picture: Stephen Lawlor. Great Black-backed Gull (Larus marinus) 3CA 1CY, November 15 2013, Dublin, Ireland. Picture: Stephen Lawlor. Great Black-backed Gull (Larus marinus) 3EN 1CY, November 21 2013, Howth, Dublin, Ireland. Picture: Graham Prole. Great Black-backed Gull (Larus marinus) 3EP 1CY, November 04-22 2013, Howth, Dublin, Ireland. Picture: Graham Prole. Great Black-backed Gull (Larus marinus) BJ 1CY, November 16 2016, Katwijk, the Netherlands. Great Black-backed Gull (Larus marinus) 1CY, November 22 2015, IJmuiden, the Netherlands. Great Black-backed Gull (Larus marinus) 1cy, November 24 2006, Boulogne/Mer, N France.